Marjorie Martin’s first husband was Charles Martin, a surveyor. 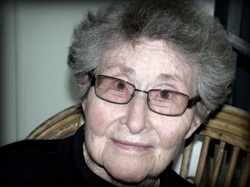 During the Second World War, while her husband was away in Darwin, Marjorie and their first son, Peter, lived at home with her parents. When they moved to 101 Royal Parade, St. John’s Wood in 1946, Peter was already 1 year and 10 months old. Their second son, Geoffrey was born in 1947. She remembers the dirt roads. Local retailers like the grocer, Mr. Franklin, called at home and the butcher, baker and milkman also made their rounds. Marjorie remembers one Christmas Eve, the baker arriving after imbibing a bit too much “Christmas Cheer”! Quite hilarious. When they first arrived in St. John’s Wood, there was no gas to the suburb, only electricity. No phone until they put through a ‘party line’ which was available to all of the houses in the Woods. A few years’later, individual phones numbers were allocated. There was not a lot of vegetation left after most of the trees had been cleared off the allotments, ready to be built on. They did not plant a vegetable garden, but did have a huge choko vine growing over the outside toilet. The sanitary man made his weekly visit too. They had no chooks. But they did start to plant out a garden with a lemon and orange tree and flowers and have a huge mango tree that still produces tasty fruit. Her second marriage was to Alfred William “Slim” Summerville. “Slim” as everyone called him already had two children, called Lee and Darcy. “Slim” was the manager of the Heritage Building Society in Toowoomba and later became a valuer. “Slim” joined the air force during the war and was sent to Canada to teach the Canadian Air Force signalling techniques. He then came back on an American troop ship to Brisbane and was then sent to Papua New Guinea before the end of the war. Marjorie worked at the Bataan Exchange as a telephonist, in the Lennon’s Hotel. Bataan was a code name for the US Army switch-board. When General MacArthur was in Brisbane, he lived in Lennon’s Hotel. His headquarters, MacArthur’s Chambers, was in the AMP building, on the corner of Edward and Queen Streets. Shopping was either done through the local retailers that came to your door. Or at Chandler’s Corner, where there was a fruiterer, butcher, a barber and a grocer. Or up the hill at “The Terminus”, as the end of the West Ashgrove tram line was known. Over the years there has been a range of retailers in the Terminus precinct. A cake shop, a barber, a hairdresser, two fruit shops, (one owned by Frank Boccalate and the other Paul?? ), the “Victory Store”, a butcher, a chemist, (Mr. Reynolds), a draper, (Mr. Usher), where everyone got their school uniforms, and later, Latu’s supermarket. Alex Lancaster, (the butcher opposite the bridge) would buy old newspapers from the local kids to use as wrapping paper for the meat, with a piece of white paper in between the meat and the newsprint. Marjorie can remember attending a Red Cross Fete in the Embassy Hall before she lived in the Woods. Then when she came to live in the Woods, fond memories of going to the pictures in the Ambassador Theatre. She played tennis on the courts along the creek on Royal Parade. There were 4 tennis courts next to the hall. She remembers going with her family on the tram to the “Elita” Theatre, on the corner of Waterworks and Stewart Roads at Ashgrove. Guy Fawke’s night was always popular and the locals usually built a big bonfire either on the school oval or in the park, probably in the park in St. John’s Avenue. The children played cricket in the park, rode their bikes, caught fish in the creek and played Monopoly. Their Christmas holidays were spent at Surfers’ Paradise, with the price of the journey included in the price. The owner would pick them up, drive them to the coast and at the end of their holiday, load up their suitcases and bring them home. Marjorie became an accomplished painter. Sometimes she feels she wouldn't have survived without her painting. 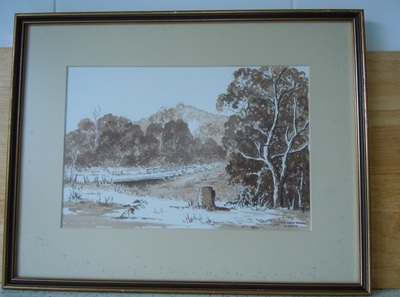 See one of her water colours of Enoggera Creek below. Transport consisted of a private bus that did a circuit of the Woods, similar to today’s Brisbane City Council buses, and then went out onto Waterworks Road and proceeded to town, via Waterworks Road or Coopers Camp Road. In 1924, the tram only went to Oleander Drive and then you either walked home or got the private bus that would meet the tram. The line was finished to West Ashgrove in 1935, much to the relief of West Ashgrove and St. John’s Wood residents. The last tram (unfortunately) was in 1968. They bought their first car in 1955, it was a Vauxhall. At first most people caught the bus and tram. Later, when cars became more affordable and the roads were improved, there were more cars in the Woods. Marjorie has lovely memories of the trees in the park opposite, the atmosphere and the community spirit. The clean creek pools, kids swimming and fishing in the creek. Keeping my garden at its best, during the hot and dry times of the year, with sometimes minimal water supplies. The 1974 flood prevented her husband and son returning home from work. The creek flooded on Friday, 25th January, 1974 and went down over the next few days. Plenty of wildlife, consisting of owls, finches, willy wagtails, parrots, white cockatoos and seeing deer on Settlement Road on an outing in the car. Mr. Hanley was a park ranger and used to leave letters in his neighbour’s letter boxes, asking them to cut down the trees on the footpath or instructing them on what to do and what not to do in the neighbourhood. 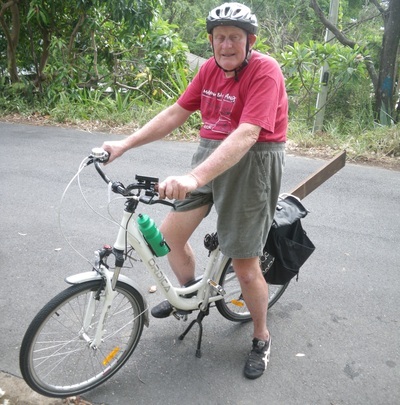 Son Geoff on his bicycle, has been a well known entity of St Johns Wood since he was a boy. On interview in 2014, Geoff said he has lived here all his life, now 56 years. He offers his opinion that they should have kept the old picture theatre where Mr Hyde had the projector box up the top. They could have done it up. It had a piano. The ballet school used to rehearse in it. He recalls how the floods got into the toilet downstairs, of the old Ambassadore theatre. 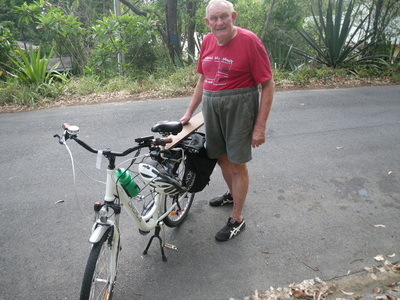 He also says people should get out of cars and onto bikes, or catch a bus, as he does. It would ease the traffic. Geoff loves old things. He gathers old wares and has them in his work shed. He enjoys working with wood. He also likes dinosaurs and can be seen visiting the museum Staff there have sometimes given him little jobs to do such as washing bones. He's an animal lover too, and enjoys regular jaunts to Australia Zoo. He goes by train, then bus. He remembers the names of streets leading to places he frequents and can draw a plan of where he is going.